This decade saw the development of the American map industry with Jedidiah Morse and Osgood Carleton in Boston and Mathew Carey and Joseph Scott in Philadelphia. 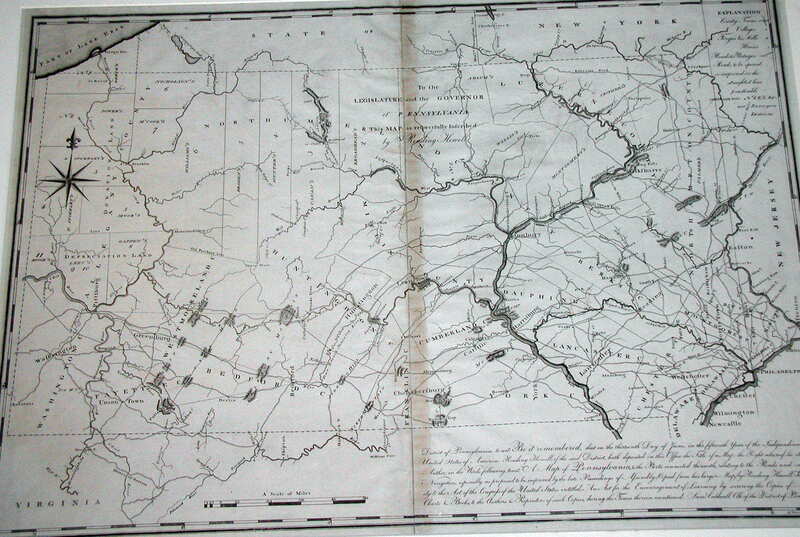 One of the most famous maps of Pennsylvania, the 1792 Reading Howell map, was published in this decade. Four new counties were created in this decade: Lycoming County (seat at Williamsport) and Somerset County (Somerset) in 1795; Green County (Waynesburg) in 1796; Wayne County (Honesdale) in 1798. As the century ended there were 25 counties in the state. 1790.1 A PARTICULAR MAP OF THE AMERICAN LAKES, RIVERS &C. par le Sr. D'Anville de l'Academie Rle... Drawn and engraved for John Harrison No. 115 Newgate Street June 25 1790. According to McCorkle (#790.1), this map is a reduced version of the original 1755 D'Anville map. Image from the Heritage Map Museum CD by permission. 1790.3 COMPLETE CHART OF THE COAST OF AMERICA, FROM BRETON INTO THE GULF OF MEXICO. This atlas of 18 charts was published by Matthew Clark, Boston 1790. McCorkle (#789.1-4, 790.3) illustrates ones for New England. 1790.4 THE UNITED STATES OF AMERICA, drawn from the Latest Authorities. T. Conder sculpt. This map of the eastern United States with a cut off Florida appeared in A New Geographical, Commercial and Historical Grammer by Alexander Kincaid, Edinburgh 1790, 92, 99 per McCorkle #790.4. Pennsylvania is shown with south and east borders, but not west or north. A few towns are named including Wyoming, Conestoga, Shamokin, Kittaning, Alleghany, Shenango. A couple of these may be apocryphal. Longitude west from Greenwich, blank verso. Scale: 1 inch = 200 miles. Size: 7.75 x 9 inches. 1790.5 THE PART OF PENNSYLVANIA THAT LIES BETWEEN THE FORKS OF THE SUSQUEHANNAH, DIVIDED INTO TOWNSHIPS. This is an anonymous manuscript map of the land between the east and west branches of the river north and west of Sunbury. It is of uncertain date, and dated 179? in Sellers & van Ee #1299. 1790.6 A MAP OF PART OF NORTH AMERICA FROM LAT. 40 TO LAT. 62, Published ...1790 by Dr. John Truster. This map of Canada extends down to 40 degrees and so includes most of Pennsylvania, which is named though nothing else is identified. 1790.7 LA CITA DI FILADELFIA, Tom 2, pag. 29 Tav. IX, by Benedetto Bordiga, in Viaggio negli Stati Uniti dell'America Settentrionale fatto negli anni 1785, 1786, e 1787, da Luigi Castiglioni Milan 1790. Castiglioni was another European with an overwhelming desire to publish the itinerary of his travels. 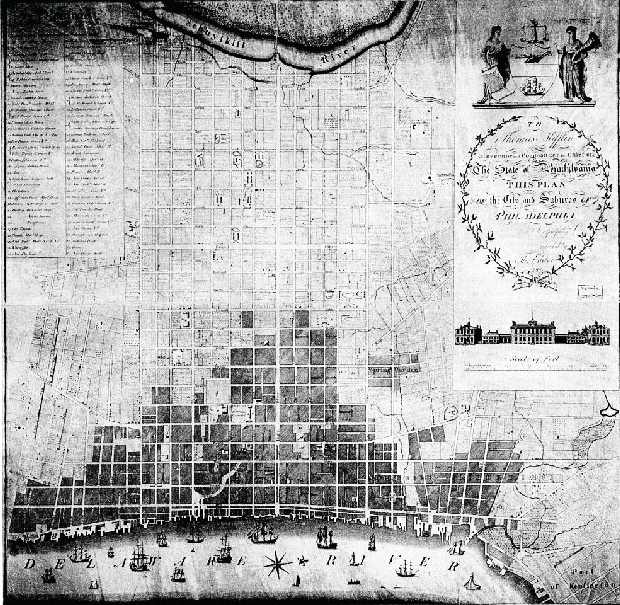 He included this simple grid map of downtown Philadelphia which he copied from John Reed's map according to M. P. Snyder, where it is illustrated in Figure 93. 1791.1 A MAP EXHIBITING A GENERAL VIEW OF THE ROADS AND INLAND NAVIGATION OF PENNSYLVANIA, AND PART OF THE ADJACENT STATES. Respectfully inscribed to Thomas Mifflin, Governor, and the General Assembly of the Commonwealth of Pennsylvania: By John Adlum, and John Wallis. The map shows settlements, forts, and physical features; annotated to show additional roads and information about them; contains inset illustrations of canal locks. Curiously, Braddock's Road from Cumberland to Pittsburgh is not shown, although the Forbes Road appears. The image shown here is a reproduction from the Pennsylvania Archives, Third Series. Wheat & Brun #432 dated 1791; Phillips page 679 dated 1792. The Library of Congress has a large number of manuscript land survey maps prepared by John Adlum in the William Bingham Estate Map collection. 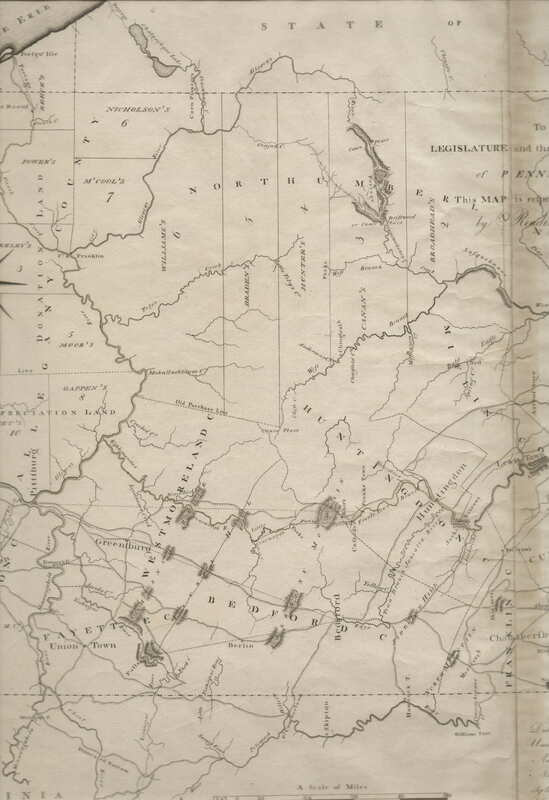 Bingham owned major land tracts across northern Pennsylvania; see Docktor #29_A1, etc. One of those maps is a reduced copy of this one. 1791.2 THE UNITED STATES OF AMERICA LAID DOWN FROM THE BEST AUTHORITIES AGREEABLE TO THE PEACE OF 1783, engraved by John Norman, published by Osgood Carleton, Boston 1791 (McCorkle #791.1, Wheat & Brun #119, 138). This map is reproduced in Schwartz & Ehrenberg, Schwartz (2000), Ristow, and shown in a Library of Congress print here. Pennsylvania has its modern northern boundary but without the Erie triangle which was purchased from New York in 1792. The 'peace of 1783' refers, of course, to the end of the Revolutionary War. Size: 32.25 x 45 inches. 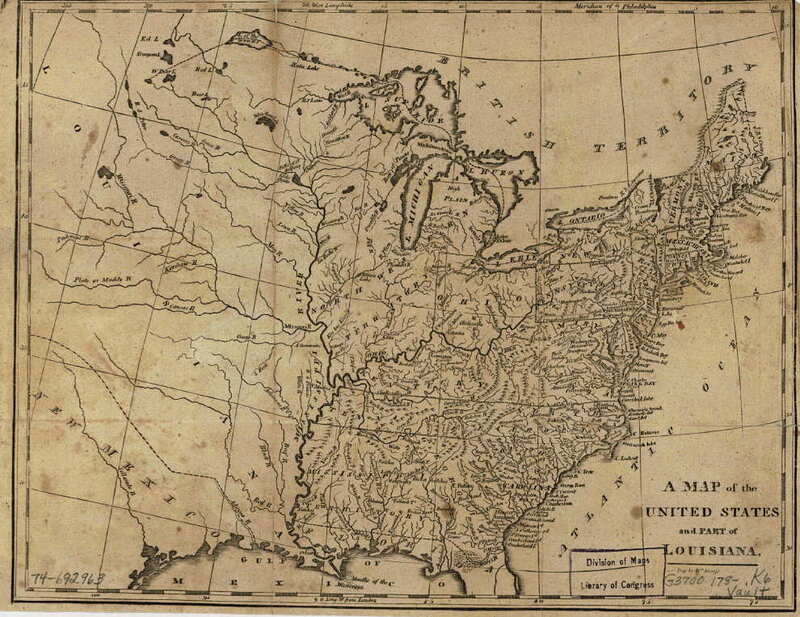 1791.3 A MAP OF THE UNITED STATES OF AMERICA. Engraved for Morses Geography. This map is from the third edition of Morse's Geography Made Easy, Boston 1791, and differs from the map in the first two editions, map 1784.2. It shows the United States from Maine to Georgia and west to the Mississippi with a cutoff Florida. Pennsylvania is shown extended to about 42d 30m with no western boundary. Georgia, North Carolina and South Carolina Western boundaries extend to the Mississippi with most of their Western territory occupied by Indian tribes: Creek, Choctaw, Chickasaw and Cherokee. North of Kentucky is shown as Army Lands, private company tracts, and Indian tribes. McCorkle #791.2, Wheat & Brun #118. The bottom says 'Longitude west from London,' but the actual zero meridian is just east of Philadelphia. Blank verso. Scale: 1 inch = 175 miles. Size: 8.25 x 10 inches. 1791.5 DE VEREENIGDE STATEN VAN NOORD AMERICA. Te Amsterdam bij W. Holtrop. This small map is a version of map 1782.10 by Holtrop though the dating is uncertain, and it is smaller and cruder. A new plate has been cut and the map considerably revised although it covers the same geography; that is, the eastern United States west to the Mississippi. Pennsylvania extends to the 43rd parallel, Philadelphia and Lancaster are named and Delaware included within Pennsylvania's borders. Blank verso, longitude west from (probably) Paris. Scale: 1 inch = 500 miles. Size: 3.75 x 4.5 inches. 1791.6 A PLANN OF THE NEW STATE ROAD PETITIONED FOR BY THE INHABITANTS OF MILFORD TOWNSHIP BEDFORD & YOHOGENNY ROAD, also called HARMAN HUSBAND'S WALKING MAP. This manuscript map is held in Record Group 26 at the Pennsylvania Archives and reproduced on page 84 in Shirk. It accompanied a petition to the state for a road over the mountains from Bedford to Milford Township (now) in Somerset County. 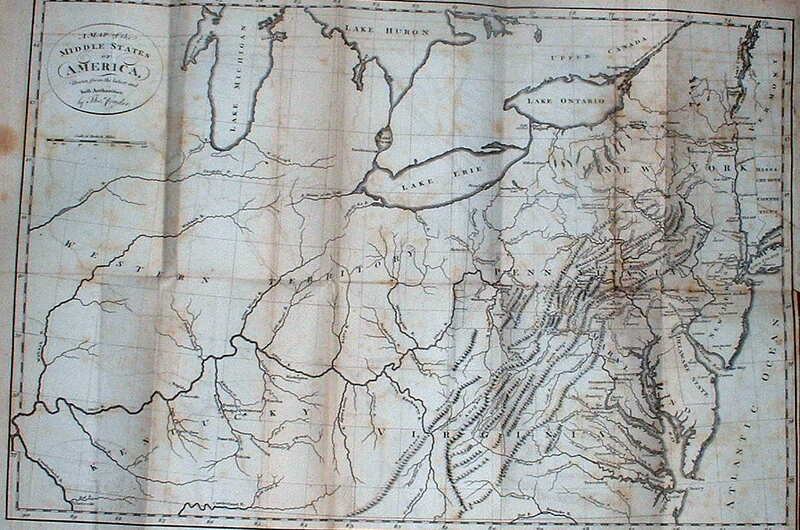 1792.1 A MAP OF THE STATE OF PENNSYLVANIA, By Reading Howell, MDCCXCII; To Thomas Mifflin Governor the Senate, and House of Representatives of the Commonwealth of Pennsylvania, this map is respectfully inscribed by the author. This is the first state (Wheat & Brun No. 433) of what is called Howell's "large map." The original map was 38 x 64 inches and issued in four printed quadrants in a succession of states (Wheat & Brun 434-36, 440-41, 453); an overview of it is given in Schwartz (2000). Most copies of the map are assembled quadrants of various states, three such copies can be seen at the Darlington Library. 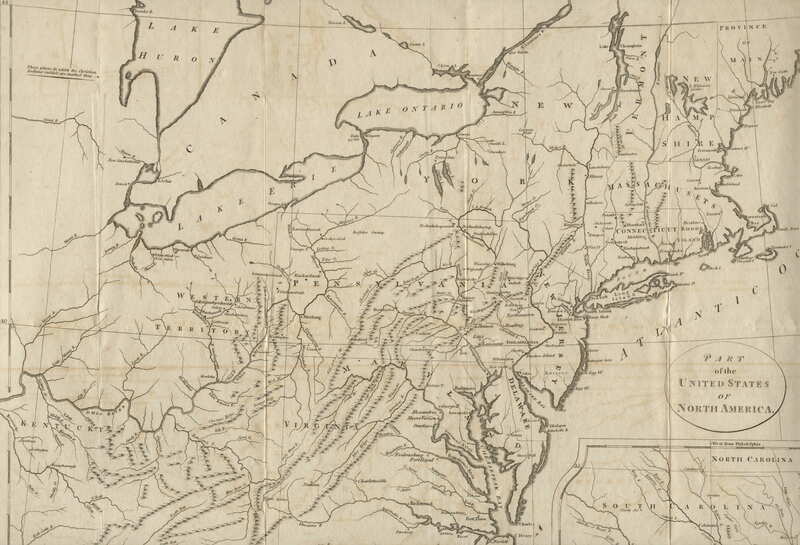 Reading Howell's 1792 map was the best one of Pennsylvania to appear in the eighteenth century. Mathew Carey used Samuel Lewis' copy of it (map 1795.3) for his publications and most other publishers from this date on used the Howell map as a model. Howell issued several versions, updating it into the early 19th century. 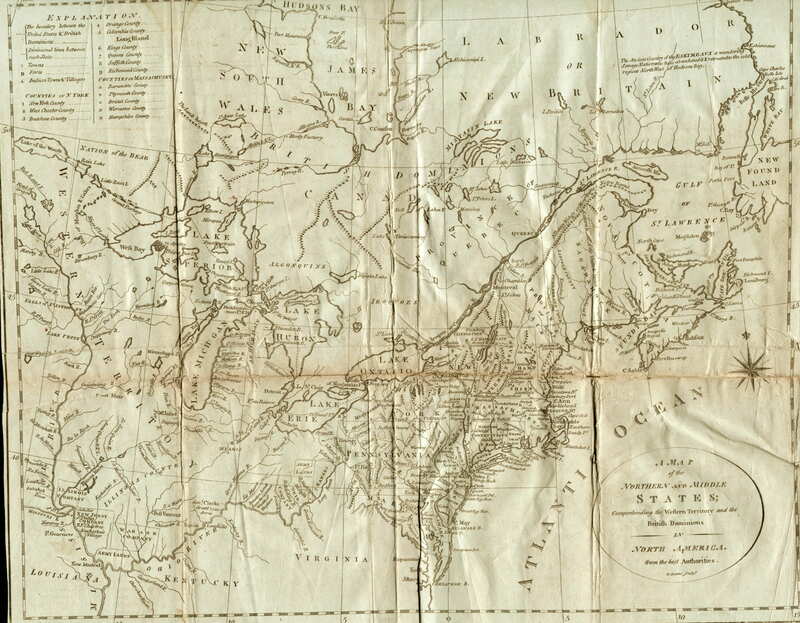 The image here is the northeast quadrant containing the title, printed circa 1810 since Ontario and Susquehanna County appear and possibly the last version of the four sheet map printed. Listed on page 679 of Phillips and discussed by Garrison, Rosenberger. Longitude from Philadelphia. Blank verso. Scale: 1 inch = 5 miles. Size: 19 x 32 inches for one quadrant. 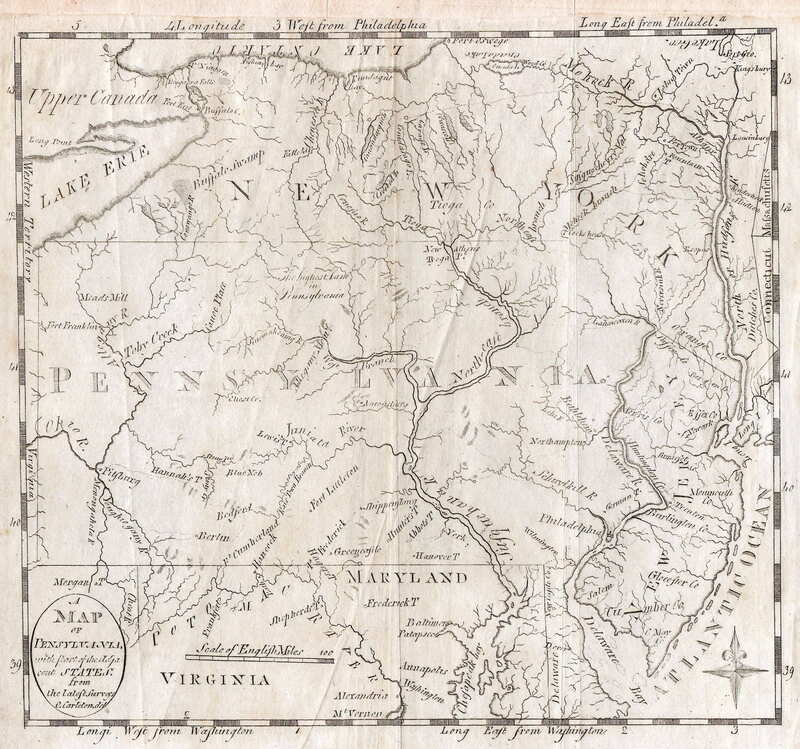 1792.2 DISTRICT OF PENNSYLVANIA TO WIT: 'IN THE FIFTEENTH YEAR OF THE INDEPENDENCE OF THE UNITED STATES'.. READING HOWELL HATH DEPOSITED A MAP OF PENNSYLVANIA, AND THE PARTS CONNECTED THEREWITH, RELATING TO THE ROADS AND INLAND NAVIGATION, ESPECIALLY AS PROPOSED TO BE IMPROVED BY THE LATE PROCEEDINGS OF ASSEMBLY. (Copied from his larger map) by Reading Howell... Sam'l Caldwell, Clk of the District of Pennsylvania. Engraving by J. Trenchard. The dedication is at upper center "to the Legislature and the Governor of Pennsylvania this map is respectfully inscribed by Reading Howell." There is an explanation table at upper right. This is the first state of Howell's "small map" of 1792 (Wheat & Brun #437). The image shown here is the state 2 version (Wheat & Brun #443) from the Schuylkill and Susquehanna Navigation Commission 1795 report An Historical Account of the Rise, Progress and Present State of the Canal Navigation. It contains some additions from the 1792 map, including the naming of all the counties with their boundaries shown. The emphasis is on transportation, showing the roads and canals through the counties and it is the most detailed of Howell's maps in this respect. Here are closeup views of east and west sections of this large map. The third state was issued circa 1796 (Wheat & Brun #447). Slightly larger versions were made in 1811 and 1817. A facsimile of this map was printed in 1834 for a US Congress report. Wheat & Brun #464 list a Philadelphia map by Howell for which a copyright reference was found circa 1794 but the map has never been seen. Longitude from Philadelphia, blank verso. Scale: 1 inch = 12 miles. Size: 18 x 26 inches. 1792.3 A MAP OF THE NORTHERN AND MIDDLE STATES; comprehending the Western Territory and the British Dominions in North America. This map appeared in English editions of Morse's American Geography published by John Stockdale, London 1792, 94. It has the same title and closely resembles map 1789.3 from the American editions. There was also a 1792 Dublin edition with a new plate of the same map, and other editions in 1795 (McCorkle #792.1,2, 795.4,6). An accompanying map of the southern states was titled "A Map of the States of Virginia, North Carolina, South Carolina and Georgia." 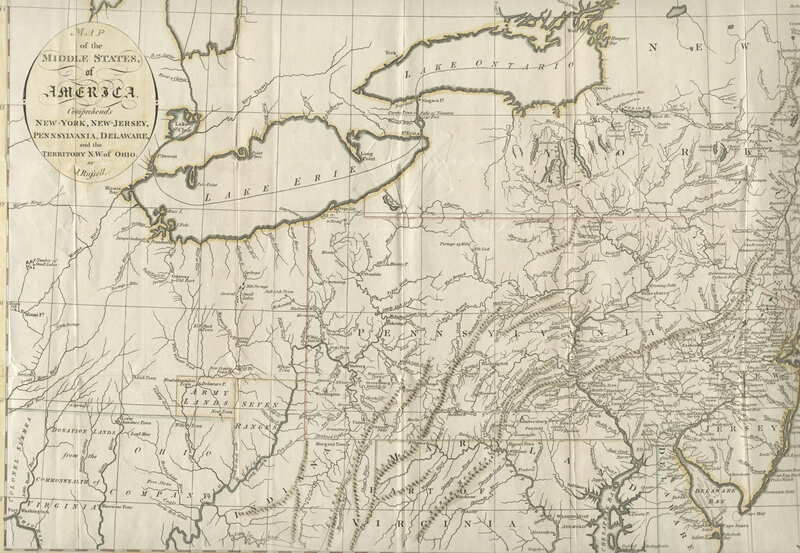 The map shows many land grants in the western territories; Pennsylvania lacks the Erie triangle. Longitude from Philadelphia at bottom, west from London at top. Scale: 1 inch = 110 miles. Size: 12 x 15 inches. 1792.4 A MAP OF THE UNITED STATES AND PART OF LOUISIANA. Eng. by Wm. Kneass. McCorkle (#780.7) dates this map to 1780, Sellers & van Ee (#738) date it 178? 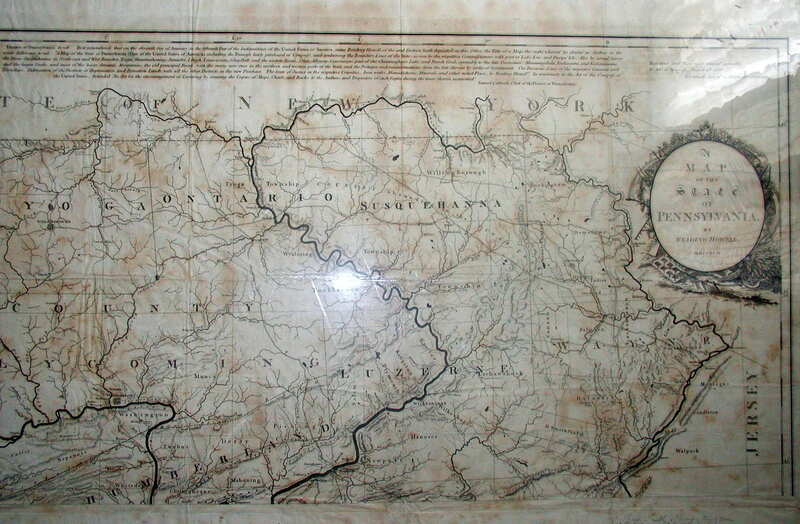 ; however it must date no earlier than 1792 because Pennsylvania has its modern boundaries including the Erie triangle. A copy of this map was found in A Geographical Dictionary of the United States of North America... by Joseph Scott, published in 1805. However, it is possible the map appeared earlier. This image is from the Library of Congress. 1792.5 (Philadelphia) An untitled and anonymous map of thirty-six lots between Locust and Spruce streets advertised for auction; it appeared in Dunlap's American Daily Advertiser in several March 1792 editions. Wheat & Brun #460. 1792.6 (Philadelphia) An untitled and anonymous map with various dimensions of wards, blocks, and streets; it appeared in Some Account of the City of Philadelphia by Benjamin Davies. Wheat & Brun #461. 1792.7 THE UNITED STATES OF AMERICA. This map comes from the 1792 edition of the Atlas Minimus originally published in 1758 by Emanuel Bowen with maps by John Gibson. The map originally titled THE ENGLISH AND FRENCH SETTLEMENTS IN NTH. 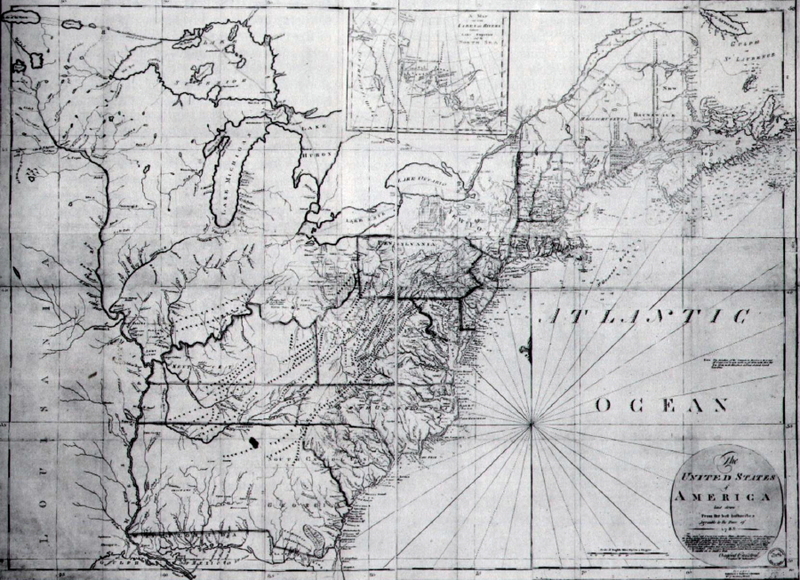 AMERICA, map 1758.6, has been renamed; also "New France" has been removed. Otherwise the map is the same as the original 1758 version. 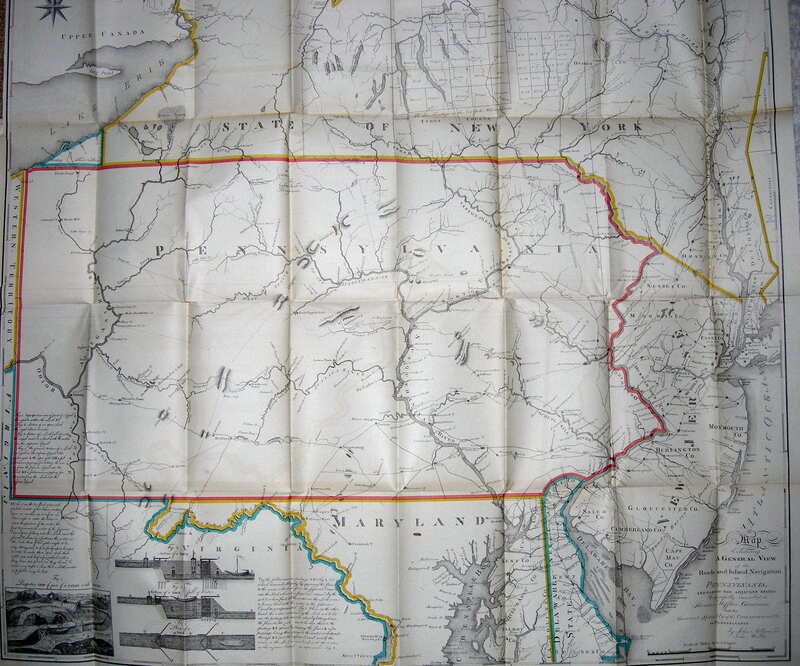 The other 1792 maps with Pennsylvania still have the same name as the 1758 maps and are unchanged, and so are not relisted here. Scale: 1 inch = 600 miles. Size: 2.75 x 3.75 inches. 1792.8 ESTADOS UNIDOS DE LA AMERICA SEPTENL. PARTE DE LA FLORIDAY EL CANADA. This Spanish map comes from Atlas Elemental Moderno ò Colección de Mapas, para enseñar á los niños Geografía, del cartógrafo Tomás López, Se editó en Madrid en 1792. There is also a facsimile edition published in 2003. It is a copy of map 1783.7 by Rigobert Bonne. Like that map, it shows the United States from Maine to Florida and west to the Mississippi. Pennsylvania's northern boundary extends to 43 degrees; the western boundary follows the Ohio south to below the 40th parallel. A table at bottom right gives the capitols of the states. Spanish names are used for physical features, i.e. lago for lake. Blank verso, with longitude markings identical to map 1783.7. Scale: 1 inch = 225 miles. Size: 9.5 x 7 inches. 1792.9 NORTH BOUNDARY OF THE STATE OF PENNSYLVANIA, a small manuscript map which is a copy of the survey conducted by Andrew Ellicott for the purchase of the Erie triangle. It is on a page of the Indian Deed Book in Record Group 26 in the Pennsylvania Archives and reproduced on page 86 in Shirk. The area shown is the purchased triangle. 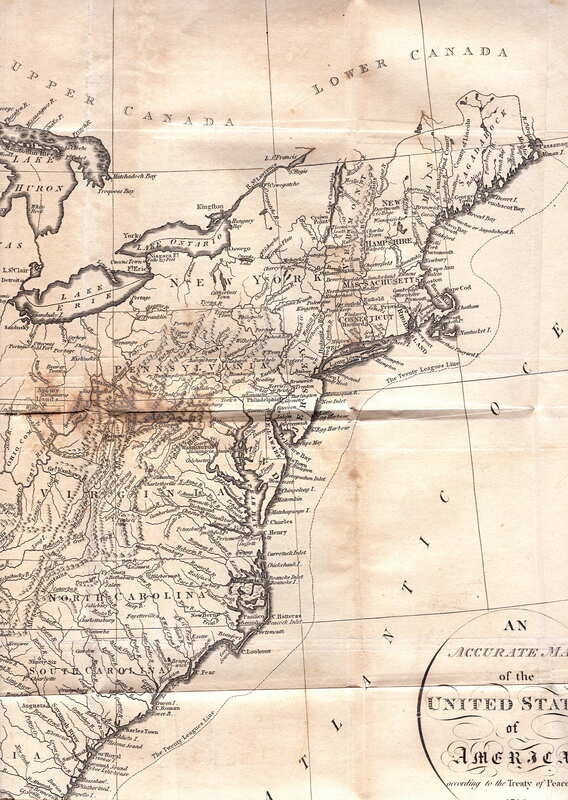 1793.1 A MAP OF PENSYLVANIA WITH PART OF THE ADJACENT STATES FROM THE LATEST SURVEYS, O. Carleton, Del. 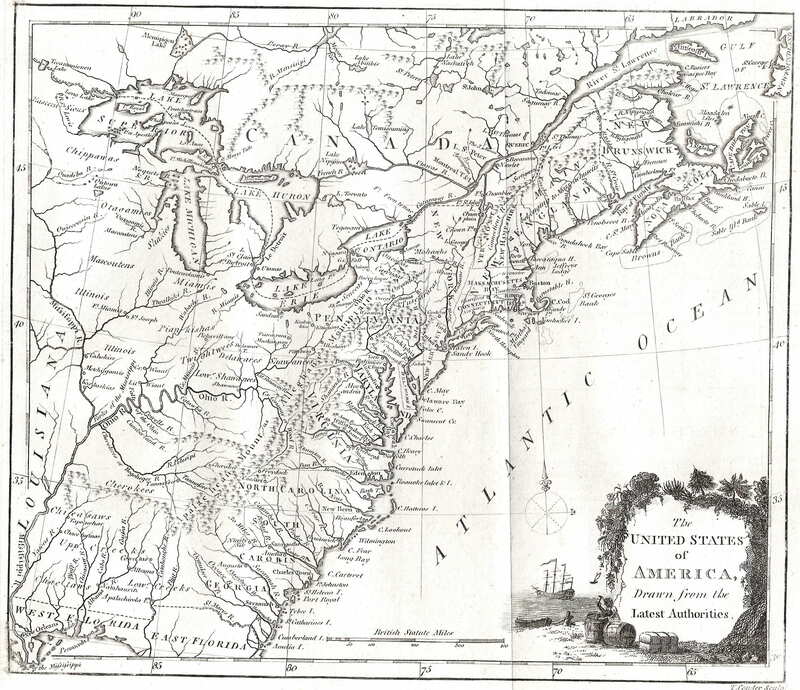 This map was published in the second edition of The American Universal Geography by Jedidiah Morse, Boston 1793. The first edition was published in 1789. Samuel F. B. Morse, the inventor of the telegraph, was the son of Jedidiah. There is no Erie triangle indicating map preparation prior to 1792. Delaware is shown separated from Pennsylvania by a dotted line. Roads are shown in very light print and there is a compass rose at lower right. Longitude is measured from Washington at bottom and Philadelphia at top. Pennsylvania is spelled with two n's on the map but with one in the title. No. 438 in Wheat & Brun and on page 679 of Phillips. Blank verso. Scale: 1 inch = 65 miles. Size 8.5 x 9 inches. 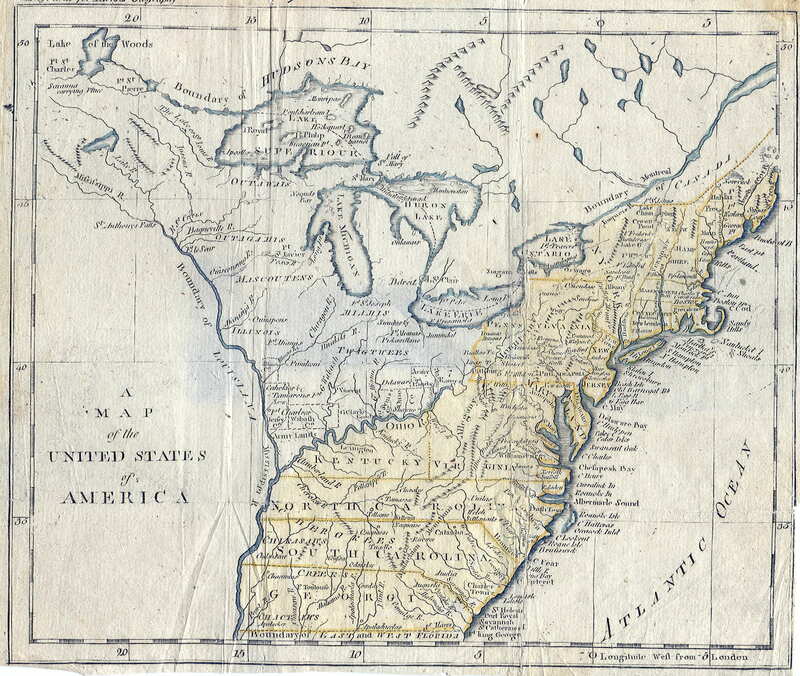 1793.2 A MAP OF THE WESTERN PART OF THE TERRITORIES BELONGING TO THE UNITED STATES. 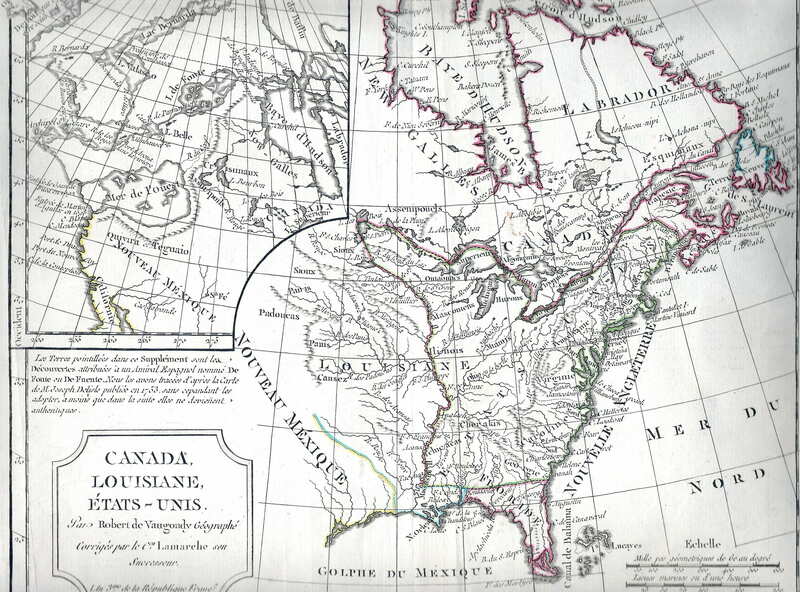 This map is from A topographical description of the western territory of North America... originally by John Filson, the second edition (with considerable additions) by George [i. e. Gilbert] Imlay, London, printed for J. Debrett, 1793. The map includes Pennsylvania and a portion is illustrated in Winsor (1899). The complete map covers the region from New York to Georgia and west to the Mississippi. There were apparently two versions of this map as a 1795 version can be seen at the Darlington Library. 1793.3 A NEW AND ACCURATE MAP OF THE UNITED STATES OF AMERICA, &c. from the best Authorities by Thomas Brown, Edinburgh. This undated map was seen at auction dated circa 1790, and purportedly from the first general atlas published in Scotland. It includes the Erie triangle (1792) and appears to postdate the creation of Kentucky (1792) and predate Tennessee (1796) and Ohio (1803), so it likely dates 1793-96. The map covers the east coast to the Mississippi River; the country west of Pennsylvania is labeled Western Territory. This map is not listed in McCorkle. Brown was based in Edinburgh and published from about 1780 to after 1800; he published an atlas of Scotland. 1793.4 DIE VEREINIGTEN STAATEN VON NOORD-AMERIKA by Johannes Walch, Augsburg. This is another undated map seen at auction dated circa 1790s. It names Kentucky (1792) but not Tennessee, so likely dates 1793-96. The map shows the east from Nova Scotia to a cutoff Florida and west to the Mississippi, with the western territories labeled "Indiana". This map is not listed in McCorkle. Most references for Johannes Walch in catalogs are after 1800, so this map may have been published later than its apparent preparation. 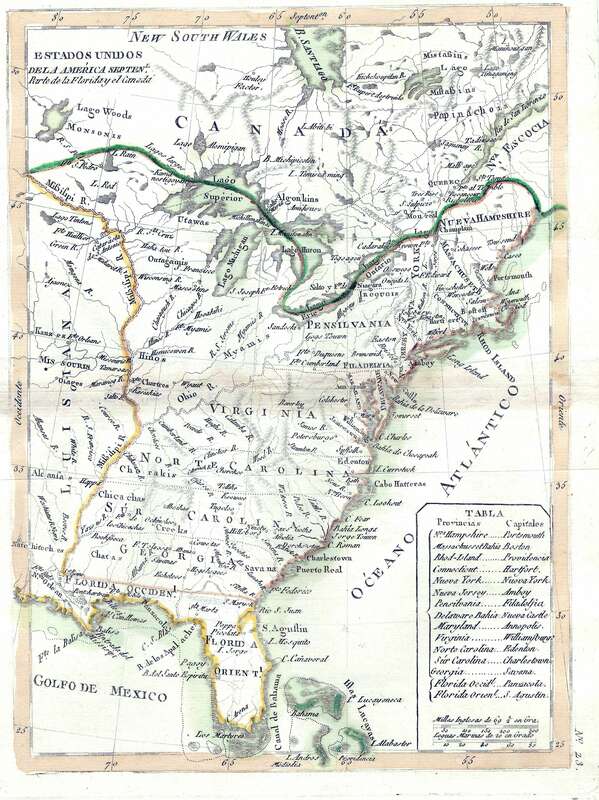 1793.5 A MAP OF THE ROUTE FROM PHILADELPHIA TO THE INDIAN-TREATY OF 1793 TO BE HELD ON OR NEAR THE MIAMI RIVER. A manuscript map from the collections of the University of Pennsylvania where it is described. The date on the map title is used but it likely dates somewhat later. Parts of it appear copied from other maps of the times. 1794.1 A MAP OF THE STATE OF PENNSYLVANIA FROM MR. HOWELL'S LARGE MAP, J. T. Scott sculp; Engraved for Carey's American edition of Guthrie's Geography Improved. The Erie triangle is not shown. Wheat & Brun #439. 1794.2 PART OF THE UNITED STATES OF NORTH AMERICA, from History of the Mission of the United Brethren among the Indians of North America by G. H. Loskiel, London 1794 (see page 870 of Phillips). Loskiel was German and the book was an English translation by C. I. Latrobe, printed and sold by John Stockdale (see Vail). The German title was Geschichte der Mission Der Evangelisten Bruder Unter Den Indianern In Nordamkerika, Barby and Lepizig 1789. The German edition was issued without a map, but the English edition, printed For The Brethren's Society For The Furthering Of The Gospel, contained this map. Stockdale made a later printing in 1798, see Phillips page 872. A map of similar title was published in Travels Through the States of North America by Isaac Weld (McCorkle #798.5). The map shows the east coast from Maine to Carolina with an inset of the Carolina coast, most of the map can be seen in this image. Longitude from Philadelphia at bottom, west from London at top. Originally folded, blank verso. Scale: 1 inch = 50 miles. Size: 16 x 18.25 inches. 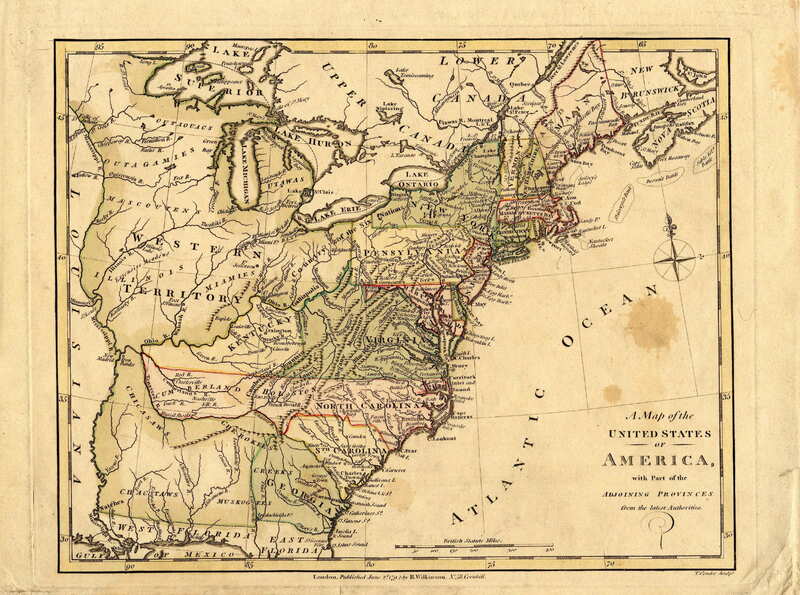 1794.4 A MAP OF THE UNITED STATES OF AMERICA. A Doolittle sc. N. Haven Published by Thomas & Andrews Boston. Engraved for the abridgement of Morse's America Universal Geography. The map actually appeared in later editions of Morse's Geography Made Easy. Pennsylvania extends north to the 43rd parallel with no western boundary shown. McCorkle #794.4; Wheat & Brun #122. 1794.6 AN ACCURATE MAP OF THE UNITED STATES OF AMERICA. according to the Treaty of Peace of 1783. Russell del. et sculp London. Published as the Act directs Oct 18, 1794 by H. D. Symonds No. 20 Pater Noster Row. 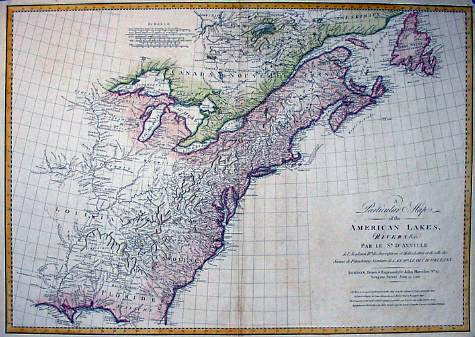 The map appeared in Historical, Geographical...View of the American United States by William Winterbotham, London 1796, and also in Russell's American Atlas. It shows the country from Maine to a cut off Florida and west to the Mississippi, only the northeast is shown in this image. Pennsylvania has its modern boundaries sans the Erie triangle, with many rivers and towns named. The same map also appeared in a new edition of Winterbotham published in 1819. McCorkle #794.14. Longitude west from London, blank verso. Scale: 1 inch = 103 miles. Size: 14 x 17.5 inches. 1794.7 TO THOMAS MIFFLIN, GOVERNOR... THIS PLAN OF THE CITY AND SUBURBS OF PHILADELPHIA is respectfully inscribed by the editor, 1794. A. P. Folie del. R. Scot & S. Allardice sculpsit. This is a detailed plan of the city which appeared in Some Account of the City of Philadelphia by Benjamin Davies. This image is from a poor modern reproduction. Wheat & Brun #462, Phillips page 701, illustrated in M. P. Snyder, Figure 106. 1794.8 PLAN OF THE CITY OF PHILADELPHIA. This map was published in James Hardie, Philadelphia Directory and Register. There was a 1796 version published in Stephen's Philadelphia Directory, for 1796 by Thomas Stevens. Wheat & Brun #463, 467. 1794.9 TO THE CITIZENS OF PHILADELPHIA THIS PLAN OF THE CITY AND ITS ENVIRONS IS RESPECTFULLY DEDICATED by the Editor. P. C. Varle Geographer & Enginr. del. ; R. Scott sculp. Philada. The dating of this map is uncertain, Wheat & Brun #465 date it circa 1794, and there is an 1802 version with additions. This map was seen at auction dated 1796 quoting the August 3, 1796, issue of the Pennsylvania Gazette as advertising the map for sale. It is illustrated in M. P. Snyder, Colorplate 12, dated 1796; and a 1802 later version in Figure 119 . A facsimile of this map with the date 1776 was put out in 1926 by a Philadelphia bank. There is also apparently a contemporary French manuscript version, see Docktor #294V7. 1794.10 (New York, New Jersey, Pennsylvania) Wheat & Brun #309 describe a topographical index map, dated circa 1794, of several sections covering parts of New York and New Jersey, and northeast Pennsylvania. It was published in The Geographical Ledger and Systematized Atlas by Christopher Colles. 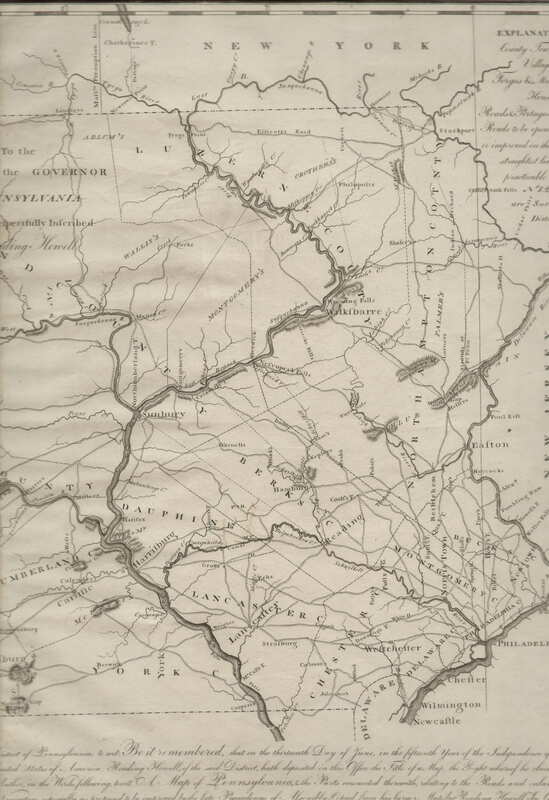 1794.11 A MAP OF PENNSYLVANIA FROM THE BEST AUTHORITIES, Published 15th July 1794 by J. Stockdale, Piccadilly. W. Harrison, Junr. sc. This map is attributed to the English edition of Jedidiah Morse's The American Gazetteer, Simonetti #654. A copy seen at auction was attributed to Morse's American Geography; so perhaps it appeared in both. 1794.12 A MAP OF THE MIDDLE STATES OF AMERICA, Drawn from the latest and best Authorities; by Thos Conder. Engraved for Cooper's Information concerning America. London, Published Augt. 12th 1794, by J. Johnson, St. Pauls Church Yard. Simonetti #298, shown here in a photo. 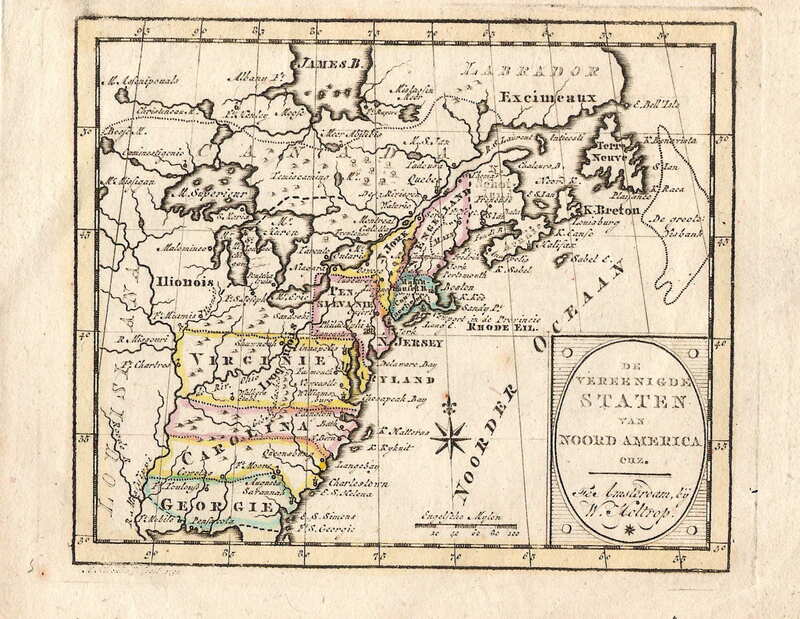 1794.13 A MAP OF THE MIDDLE STATES, OF AMERICA. Comprehends New York, New Jersey, Pennsylvania, Delaware, and the Territory N.W. of Ohio by J. Russell. There is a small inset of Long Island at the top. The image here shows most of the map including the Pennsylvania region. This map is believed to be from Winterbotham, a companion to map #1794.6 above. Longitude west from London, blank verso. Scale: 1 inch = 34 miles. Size: 14 x 18 inches. 1794.14 CANADA, LOUISIANE, ETATS-UNIS. par le S. Robert de Vaugondy Geographe. Corrigee par le Ccn. Lamarche son successeur l'an 3me. de la Republique Franc? Grave par E. Dussy. This is a reissue of map 1762.4 with United States added to the title. Dated 1794 by McCorkle (#794.13), though versions dated to the early 1780s have been seen at auction. The area from Labrador to Florida and west to beyond the Mississippi is covered. There is an inset at upper left of northwest North America. State boundaries are crudely indicated with dotted line; "Pensylvanie" extending only to the Alleghenies. Philadelphia is also named. This is a recycled old map out of date when issued. Blank verso, longitude apparently east of Ferro. Scale: 1 inch = 300 miles. Size: 9.5 x 11.5 inches. 1794.16 A MAP OF THE BACK SETTLEMENTS, published July 30, 1794, by J. Stockdale Piccadilly. This map is from the 1794 London edition of An American Geography by Jedidiah Morse. The coverage includes western Pennsylvania to the Mississippi and south to include what will become Tennessee. Everything west of Pennsylvania is called the Western Territory with a very strange Indiana where West Virginia will be. The map also shows Bounty Land Grants for soldiers and some frontier forts. 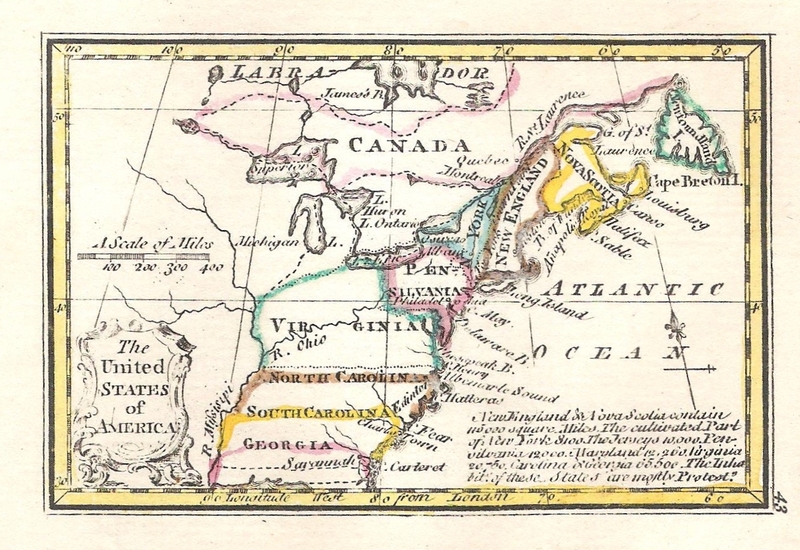 1794.17 CARTE DES ETATS MITOYENS DE L'AMERIQUE UNIE DRESSEE D'APRES LES AUTORITES LES PLUS NOUVELLES ET LES MIEUX CHOISES par Thos. Conder G. par H. de Monthuchon a Altona 1794. 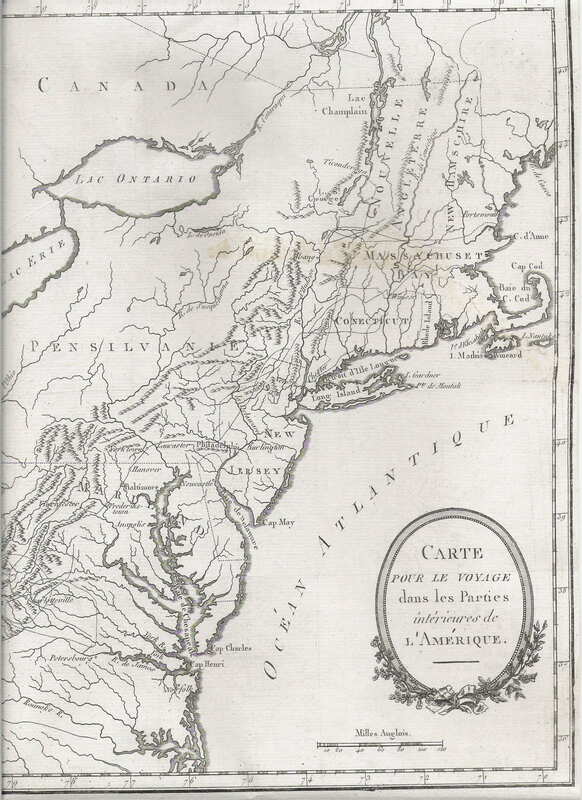 A French map of the Middle Atlantic region west to Lake Michigan; apparently copied from a map by Thomas Conder. It shows little detail except for naming some rivers. 1794.18 SKETCH OF FAYETTE'S POSITION AT BARREN HILL. A map from The history of the origin, progress, and termination of the American war By C. Stedman, London : printed for the author; and sold by J. Murray; J. Debrett; and J. Kerby, 1794. There were several printings of this two volume work. The map shows an area near the Schuylkill River where La Fayette's French troops were positioned during the Battle of Barren Hill; one of the several actions around Philadelphia when General Howe entered the city and forced Washington west to Valley Forge.